In August, Australian pedal brand Bondi Effects debuted a brand-new pedal at the Melbourne Guitar Show, the Art Van Delay. Today, the vintage-style bucket-brigade delay unit is available for purchase, and we have Andy digging in to see what it can do. It's the first delay pedal from the boutique builders known for their Sick As, Breakers, and Del Mar overdrives —and it's available exclusively through Reverb for the next four weeks. 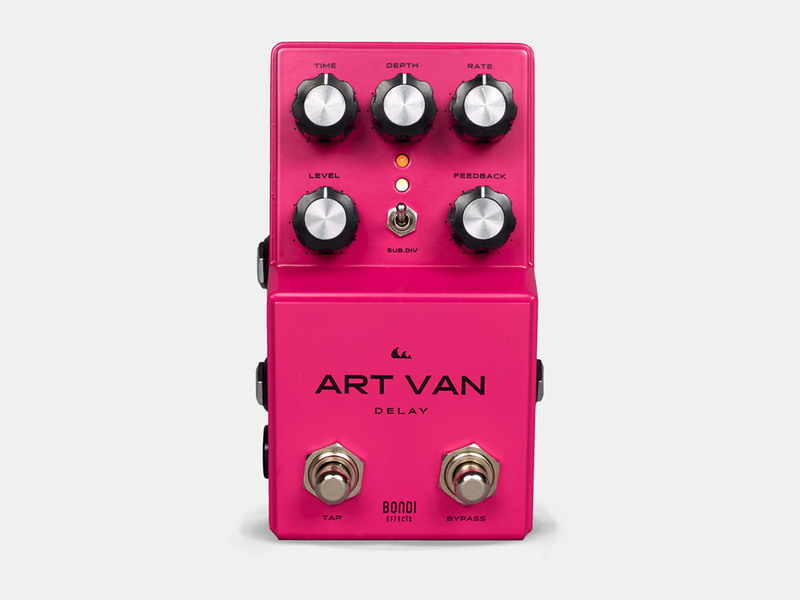 The throwback vibes of the Art Van Delay are apparent just by looking at its vibrant pink chassis, paying homage to legendary Boss and Ibanez predecessors from the '70s and '80s. Internally, the vintage callbacks continue, with its all-analog delay circuit promising up to 1200 milliseconds of delay time. Control-wise, players get the classic Level, Feedback, and Time knobs, as well as dedicated Depth and Rate controls for shaping modulation. You can also take advantage of the tap tempo/hold switches, with selectable sub-divisions set in the center switch, for controlling the Art Van tempo to a microsecond or holding into a wish-wash of sound. The Art Van Delay also features MIDI outputs and is already pre-loaded with two MIDI presets (and the ability to store a total of 32 presets). Each function of the pedal is accessible using it’s MIDI control, allowing your tone-shaping to be as free-flowing or as micro-managed as you would like. Be sure to check out the full video above, and click here to get your own right here on Reverb.